Acquired in Italy by Louis-Charles Timbal [1821-1880], Paris, before 1871; sold 29 November 1872 with his collection to Gustave Dreyfus [1837-1914], Paris; his heirs; sold 1930 with the entire Dreyfus collection to (Duveen Brothers, Inc., London, New York, and Paris); sold May 1936 to the Samuel H. Kress Foundation, New York; gift 1939 to NGA. The painting was attributed by Timbal to Piero, according to the list of art objects sold by Timbal to Dreyfus (copy of the list in NGA curatorial files, dated 29 November 1872). A provenance from the University in Bologna, as reported by Rosemarie Molajoli, L'opera completa di Cosmé Tura e i grandi pittor ferraresei del suo tempo: Francesco Cossa e Ercole de' Roberti, Milan, 1974: 98, and Fern Rusk Shapley, Catalogue of the Italian Paintings, 2 vols., Washington, D.C., 1979: 1:407, remains undemonstrated. Nor is it convincing to identify the NGA's painting and its pendant, Ginevra Bentivoglio (NGA 1939.1.220), with likenesses mentioned by Antonio di Paolo Masini in the seventeenth century. Molajoli and Shapley (see above citations) stated that, according to Masini's Bologna perlustrata, Bologna, 1966: Part I, 213, there were portraits attributed to Cossa by Masini that fit the description of the NGA pair. The erroneous identification of the Gallery's portraits with those mentioned by Masini is repeated by Monica Molteni, Ercole de' Roberti, Milan, 1995: 129. Actually, the portraits discussed by Masini flanked the Madonna del Baraccano, an older work that Giovanni I Bentivoglio and Bente Bentivoglio had Cossa alter in the 1470s. Even supposing that Masini's passage somehow describes the NGA portraits, one must note that the male sitter is described as being eighteen years of age (far younger that Giovanni II's likeness in the NGA) and the directions the couple face do not correspond to Masini's description ("Bente vi fabricò un altare, ed a destra vi si fece ritrare al vivo in età d'anni 18 ed a sinistra la sudetta Donna, per mano del pittore Francesco Cossa..." ["Bente had an altar built there and to the right had himself portrayed at the age of 18 and at the left the earlier-mentioned woman, by the hand of Francesco Cossa"]). Furthermore, the whole passage by Masini is criticized for its inaccuracies and impossible dates by an editor of Giovanni Baruffaldi, Vite de' pittori e scultori ferrarese, 2 vols., Ferrara, 1844: 1:17-19. In short, there is no known provenance for the NGA's diptych from before the nineteenth century. The provenance previous to 1872 is known from Fritz Harck, "Die Fresken im Palazzo Schifanoia in Ferrara," Jb Berlin 5 (1884): 118; Wilhelm Bode, "Die Ausbeute aus den Magazinen der Königlichen Gemälde Galerie zu Berlin," Jb Berlin 8 (1887): 126; and information on the back of a photograph in the Frick Art Reference Library, New York. The Duveen Brothers letter confirming the sale of thirteen paintings and one sculpture, including NGA 1939.1.219 and .220, is dated 18 May 1936; the provenance is given as "Dreyfus Coll'n" (copy in NGA curatorial files; Box 474, Folder 5, Duveen Brothers Records, accession number 960015, Research Library, The Getty Research Institute, Los Angeles). Italian Renaissance Portraits, M. Knoedler and Company, New York, 1940, no. 8, repro. Berenson and the Coinnoisseurship of Italian Painting, National Gallery of Art, Washington, D.C., 1979, no. 54, repro. Virtue and Beauty: Leonardo's 'Ginevra de' Benci' and Renaissance Portraits of Women, National Gallery of Art, Washington, D.C., 2001-2002, no. 2A, color repro. Ephrussi, Charles. "Les Médailleurs de la Renaissance par M. Alöiss Heiss." Gazette des Beaux-Arts (1886): 72, repro. Gruyer, Gustave. L'Art Ferrarais a l'époque des Princes d'Este. Paris, 1897:120, as by Francesco del Cossa. Venturi, Adolfo. Storia dell'Arte Italiana. 11 vols. Milan, 1901-1940: 7(1914): 653, repro., as by Francesco del Cossa. Cook, Herbert. "Trésors de l'art en Italien en Angleterre." Gazette des Beaux-Arts (1902):452-453, repro. as attributed to Bianchi. Reinach, Salomon. Répertoire de peintures du moyen âge et de la Renaissance (1280-1580). 6 vols. Paris, 1905-1923: 3(1910):241, as by Francesco del Cossa. Berenson, Bernard. North Italian Painters of the Renaissance. New York and London, 1907: 218, as by Maineri or possibly Bianchi. Les Arts 73 (January 1908):10, repro., as by Francesco del Cossa. Mayer, August L. "Die Sammlung Gustave Dreyfus." Pantheon 7 (1931):11, repro. Venturi, Lionello. Italian Paintings in America. 3 vols. New York and Milan, 1933: 2:352, as by Francesco del Cossa. Longhi, Roberto. Officina Ferrarese. Rome, 1934:75, repro. ; rev. ed. Florence, 1956:46-47, repro. Ady, Cecilia M. The Bentivoglio of Bologna: A Study in Depotism. Oxford, 1937:repro. Frankfurter, Alfred M. "Great Renaissance Portraits: A Unique Exhibition of Twenty-five Italian Masterpieces." Art News (March 16, 1940):repro. Suida, Wilhelm. "Die Sammlung Kress, New York." Pantheon 26 (1940): 273, repro. Duveen Brothers. Duveen Pictures in Public Collections of America. New York, 1941: no. 63, repro., as by Francesco Cossa. Ortolani, Sergio. Cosmè Tura, Francesco del Cossa, Ercole de'Roberti. Milan, 1941:158, repro. Preliminary Catalogue of Paintings and Sculpture. National Gallery of Art, Washington, 1941: 170, no. 330..
Richter, George Martin. "The New National Gallery in Washington." The Burlington Magazine for Connoisseurs 78 (June 1941): 178. Book of Illustrations. National Gallery of Art, Washington, 1942: 246, repro. 178. Cairns, Huntington, and John Walker, eds. Masterpieces of Painting from the National Gallery of Art. New York, 1944: 54, color repro. Frankfurter, Alfred M. The Kress Collection in the National Gallery. New York, 1944: 33, repro. Paintings and Sculpture from the Kress Collection. National Gallery of Art, Washington, 1945 (reprinted 1947, 1949): 80, repro. Einstein, Lewis. Looking at Italian Pictures in the National Gallery of Art. Washington, 1951: 50-53, repro. Neppi, Alberto. Francesco Del Cossa. Milan, 1958. Paintings and Sculpture from the Samuel H. Kress Collection. National Gallery of Art, Washington, 1959: 118, repro. Ruhmer, Eberhard. 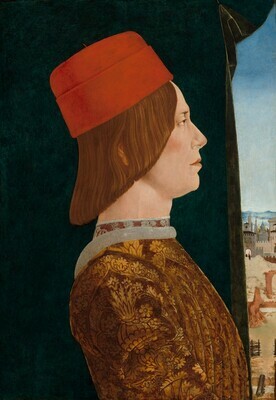 Francesco Del Cossa. Munich, 1959:93, repro. Shapley, Fern Rusk. Early Italian Painting in the National Gallery of Art. Washington, D.C., 1959 (Booklet Number Three in Ten Schools of Painting in the National Gallery of Art, Washington, D.C.): 34, color repro. Salmi, Mario. Ercole de' Roberti. Milan, 1960:19, repro. Walker, John, Guy Emerson, and Charles Seymour. Art Treasures for America: An Anthology of Paintings & Sculpture in the Samuel H. Kress Collection. London, 1961: 48, color repro. pl. 43. Walker, John. National Gallery of Art, Washington, D.C. New York, 1963 (reprinted 1964 in French, German, and Spanish): 301, repro. Summary Catalogue of European Paintings and Sculpture. National Gallery of Art, Washington, 1965: 115. Cairns, Huntington, and John Walker, eds. A Pageant of Painting from the National Gallery of Art. 2 vols. New York, 1966: 1:64, color repro. Shapley, Fern Rusk. Paintings from the Samuel H. Kress Collection: Italian Schools, XIII-XV Century. London, 1966: 86-87, fig. 232. Molajoli, Rosemarie. L'Opera completa di Cosmè Tura e i grandi pittori ferraresi del suo tempo: Francesco Cossa e Ercole de'Roberti. Milan, 1974:no. 123, repro. European Paintings: An Illustrated Summary Catalogue. National Gallery of Art, Washington, 1975: 306, repro. Shapley, Fern Rusk. Catalogue of the Italian Paintings. 2 vols. National Gallery of Art, Washington, 1979: I:406-407, II:pl. 288. Walker, John. National Gallery of Art, Washington. Rev. ed. New York, 1984: 112, no. 89, color repro. European Paintings: An Illustrated Catalogue. National Gallery of Art, Washington, 1985: 353, repro. Manca, Joseph. The Art of Ercole de’ Roberti. Cambridge, 1992: 11, 21, 34-35, 104-106, fig. 5a. Boskovits, Miklós, and David Alan Brown, et al. Italian Paintings of the Fifteenth Century. The Systematic Catalogue of the National Gallery of Art. Washington, D.C., 2003: 602-607, color repro. Hand, John Oliver. National Gallery of Art: Master Paintings from the Collection. Washington and New York, 2004: 27, no. 20, color repros.